​This update focuses mainly on adding a day/night cycle, but it also adds a bunch of other improvements, including new achievements, new items, and character customization. For the character customization, we originally considered letting you choose your appearance, but then we realized how very unrealistic that would be. So instead, your character is “born” with randomly assigned colors, and until you get higher tech or magic to change your appearance (like hair dyes and color contacts), you will be stuck with those colors. I hope you’ll be able to accept - and even grow to love - your character, even if he ends up with bright purple skin or neon green hair. We’ll be adding more hair styles and a gender option in a later update, but once again, these will be assigned randomly (with the ability to change them via upgrades). All of your past saves have been randomly assigned appearances. Feel free to share screenshots to show off how beautiful your unique characters now are! Day/Night Cycle. The world now slowly changes between night and day. You can rest in your hut to switch between day and night. This includes a lighting system which adds a lot of ambience to night and deep underground. 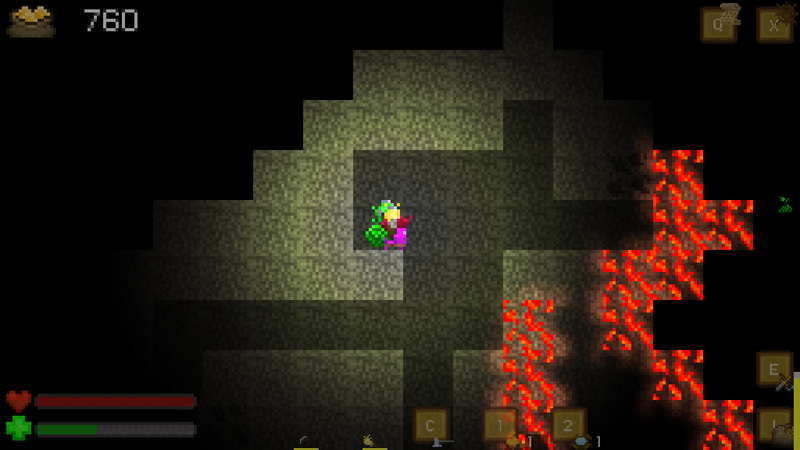 Light-producing items (like torches) are now more valuable. New night-only enemies. They are more dangerous than daytime enemies - so you might want to sleep at night if you aren’t prepared for them. Custom character appearance. You can now have different color skin, eyes, hair, and clothing. We’ll eventually add additional hair styles and a gender option. We also updated all of the equipment for this new system. New items and enchantments, including backpacks (and a new equipment slot for them), light producing items, and the upgraded workbench. Wyrms can now be familiars, and they increase your mining speed. Coins are now stored in the coin purses, and you can obtain more than one coin purse to increase your coin limit. Equipment is now shown on screen so you can quickly see what is about to break. For mouse-using players, you can click it to perform equipment actions. Flight no longer takes stamina - instead it takes power or enchantment power. There is also now a flight weight limit (to keep you from flying infinite weight). A bunch of other minor improvements and bugfixes. This was the second and final general improvements update. We will now begin working on content updates for the science island (and after that, content updates for the magic island). Also, happy April Fools day everyone! Enjoy, and as always, let us know if you have any feedback! When in steam eatrly access, will it be available for Mac? Lower the wyrm's health as much as you can before trying to capture it. The catch rate increases from about 5% to 80%.